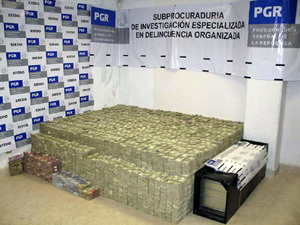 Back in 2006 and 2007, we witnessed a jaw-dropping corruption saga in Mexico with the seizure by federal police of $205 million — in cash! –from the Mexico City home of Zhenli Ye Gon, accused by Mexican authorities of serving as a leading source of methamphetamine inputs in the hemisphere. Ship it in from China, cook it in Juarez and shop it to the Hell’s Angels in Texas. Previous posts, from a predecessor blog of mine. on the subject are here. The naturalized Mexican citizen — his Wikipedia page proclaims his innocence — threatened to expose a money-laundering operation allegedly feeding the election coffers of the ruling PAN political party. At one time, a PAN senator was accused of having expedited his citizenship while serving as Secretary of the Interior, but nothing came of the charge. El Chino now awaits trial in the U.S., followed by extradition to Mexico. Mexican investigative journalist Carmen Aristegui notes the link between this case and recent revelations of lax money-laundering enforcement by HSBC. According to a report released on Tuesday by the Permanent Subcommittee on Investigations of the Mexican Senate, HSBC executives allowed Ye Gon to maintain his accounts at the bank despite suspicions about the provenience of the funds. “The accounts were not identified as risky despite atypical transactions that had caught the attention [of regulators] between 2003 and 2007,” the report, released during a hearing, reads. Ye Gon, who is currently subject to extradition from the U.S. to Mexico, was detained in 2007 in Maryland and charged with manufacturing and intent to distribute amphetamines. The 300-+ page report states that in 2005, the accounts of Ye Gon’s firm, Unimed Pharm Chem México S.A. de C.V were blocked by the bank’s Mexican subsidiary for «suspicious activity». When the HSBC branch argued for the closure of this account, this measure was rejected after the bank’s personal financial service gave Ye Gon a clean bill of health. On the heels of a subsequent investigation that uncovered the illicit dealings of Ye Gon, the same bank employee said he had been deceived by employees of the firm in question. Las pesquisas sobre el caso revelaron también que las visitas por parte de funcionarios del banco a la empresa, registradas en reportes internos, nunca tuvieron lugar. Investigations also showed that visits to the company by bank officials, described in internal reports, never actually took place. El Chino’s Wikipedia entry is as bizarre as it is self-serving — a fine example of the autohagiography by proxy that sometimes mars Wikipedia items on current events. After amassing his fortune, Ye Gon grew worried for his adoptive homeland, having discovered a strong demand for methamphetamines in Mexico, with no companies to meet said demand. For that reason, Ye Gon, out of concern for Mexican youth, decided to meet this growing demand, and built his Mexican empire. The Chinese businessman went to talk with various government agencies and political forces in a bid to address this problem. The president at the time, Vicente Fox — Chen-Te-Fox in Mandarin Chinese — perceiving Ye Gon’s love for little Mexican boys and girls, naturalized El Chino as a Mexican citizen. The governor of Mexico state, moved by the desires of this adoptive Mexican citizen, presented him with a site where he could build his factory. The governor of Veracruz decided to support him, granting him credentials that enabled him to lobby Mexican senators. The PAN and the Attorney General’s Office supported all of the activities and legal filings he needed in order to import raw materials and advised him he should open his firm as a pharmaceutical company, since the company was to market medicines. The item is shot through with translations into Spanish spoken with a Chinese accent — you know, the distinctive substitution of «l» for «r». In the face of such a friendly and blunt response, El Chino agreed to store the cash. Later on, the abandonment of Ye Gon to his fate by PAN politicians and authorities is compared to the denial of Christ by Saint Peter. The takeaway from this murky affair, I suppose, is that no one has yet explained the astonishing spectacle of $200+ million in some guy’s closet. The HSBC connection is sited in a current political corruption case as well, though it is not described as central to the scheme..
A USDOJ investigation presented on May 22, 2012 established that Fernando Cano, an alleged go-between of Yarrington, had at least 10 accounts at Banamex, BBVA Bancomer, HSBC, Banregio and Scotiabank, which were used to transfer the bribe money to Yarrington. Fernando Cano Martínez and other defendants not identified by USDOJ concentrated large amounts of cash in various Mexican banks, which they then sent to the American Union using the transfer services of Monex. Monex is the financial services firm accused of using debit cards to purchase votes in this year’s elections. The resources were used to buy real estate in San Antonio, Texas. The man’s English-language Wikipedia item is more reality-based. [Yarrington] was accused in early 2012 for laundering money for Los Zetas and the Gulf Cartel, after a drug cartel member was apprehended and informed the DEA that Yarringnton had ties with the leaders of the drug trafficking organizations. In addition, Yarrington was accused of plotting the assassination of Rodolfo Torre Cantú, the former candidate for state governor in Tamaulipas, along with the Gulf Cartel, which reportedly carried out the ambush that killed the politician.